Anybody who has worked in the corporate world for any amount of time knows that the way you look is at least as important as the way you speak or act. People naturally put a lot of stock in first impressions. So when you look the part, others are more likely to assume you know what you are doing. The same holds true for transportation. If you are planning a corporate outing or using a charter service to move your people from one place to another, the type of vehicle you arrive in matters. A lot. Pull up in a broken down old school bus and other people aren’t going to take you seriously. Similarly, if you arrive in an outdated, unkempt bus that has seen better days, it’s going to reflect poorly on your professional reputation. There’s an axiom in business that says, “Dress for the job you want, not the job you have.” The same could be said about the type of charter you use to transport your people. If you want to be taken seriously in business, if you want others to see you as an up and coming company that is going to lead the industry, then you need to look the part. 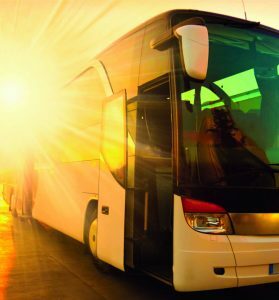 Booking a charter from FloridaTours.com ensures that your employees are going to pull up to the curb in a state of the art, elegantly appointed bus that is dressed for corporate success. In business, the little details can make a big difference. When your competitors see your group arriving in a modern FloridaTours.com charter bus, they are going to be not only impressed but also perhaps a little intimidated. Don’t make the mistake of choosing just any charter company for your next corporate outing. If you want to be the best, you need to ride with the best: FloridaTours.com.